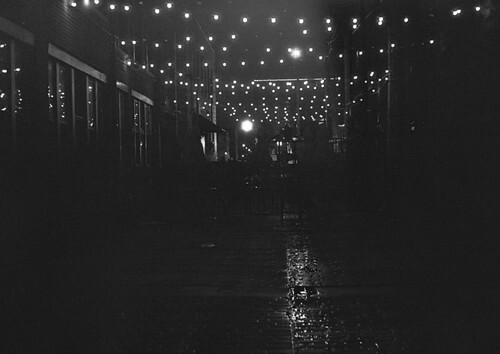 I wanted to try shooting a roll of Tri-X 400 in really dark conditions and then use the “minimal agitation” method for development. 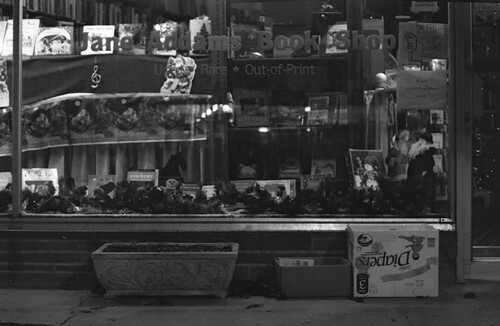 I developed the film in Rodinal 1:50 for 55 minutes, agitating every 5 minutes via 3 gentle inversions. For someone with no reference point, I’d say the pictures turned out okay. 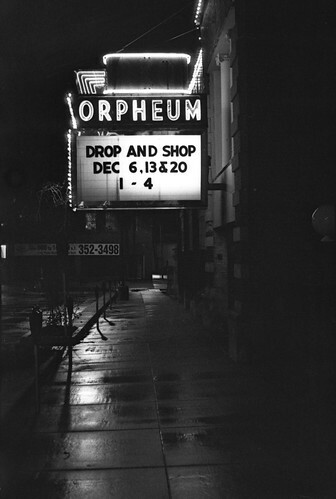 I particularly like the one above, Orpheum. My camera’s meter wasn’t responding, so I just shot everything at f/4, 1/60. I find that focusing with my Pentax is very hard. More specifically, I find that it’s really hard to focus wrong. Even when I am careful I tend to mess it up. I’m not sure what’s going on there. I am still having difficulties deciding if I’m getting the best that I can out of my scanner. After development, the Tri-X comes out (for me anyhow) very bowed. The film holder that came with the Epson v500 is relatively flimsy and does not provide any sort of support for the film. So, I ditched it. I instead placed the film on the flat bed (emulsion side up, if I remember correctly) and put a piece of glass from an 8×10 frame on top. Unfortunately, using this method I couldn’t figure out how to crop properly in Vuescan. Argh! One frustration after another! So, I went back to Epson Scan. I think that I got a better scan, but this could just be a placebo affect. This has lead me to seriously think about buying an enlarger. I have been watching them on Ebay for a few weeks now. Am I just asking for more headaches? Probably.